A Safe, Environmentally Friendly Plate For Kids. A natural fiber dinner plate that is totally safe for people and better for the environment. It looks and feels like plastic, but is made from a unique natural material derived from rice husks. These plastic-like dishes are a safe and practical alternative to traditional versions. They are super thick and virtually unbreakable, yet remain all natural and 100% biodegradable. Able to withstand high heat, be washed in the dishwasher, and used in the microwave, these plates will even outperform many of those regular plastic dishes. They are even easy to clean since they allow for less sticking and staining when compared with regular plastic dishes. Food will wipe right off leaving a perfectly clean surface with very little effort. Help reduce waste by choosing a more environmentally friendly way to feed your kids. This dinner plate offers a large 8.5" diameter to allow for a perfect amount of food. It is separated into three sections to make feeding time easy. Keep different portions of food separated and more closely gage serving size. The little walls that serve as dividers also make eating easier for kids. They are able to scoop against them and more easily collect bites of food. 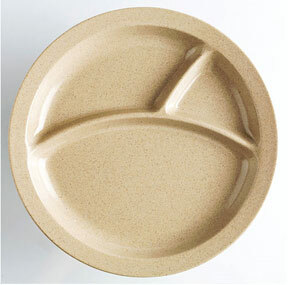 This natural fiber plate is perfect for dinner time when children are typically fed a variety of foods. Place the main dish in the large section, a vegetable in another and then a starch like potatoes in the third. Children are able to see the different food groups represented and concentrate on one type of food at a time. Thick natural fiber construction makes these plates incredibly durable and easy for small hands to grasp and maneuver. Little Husks tableware for kids are constructed from a plastic like material that is formed from 100% natural fibers. It is made from rice husks which are a plant byproduct that would otherwise be burned or thrown away. This all natural material ends up being super durable and incredibly functional, but also remains totally safe and 100% biodegradable. You can put them in the microwave and dishwasher and use them just like any other dish. Little Husks will last for years under normal use, but when they are exposed to optimal conditions, or soaked in water for longer than a week, the biodegradation will begin. They can withstand a high degree of heat, and do not contain any toxic materials. Little Husks line of plastic dishes are guaranteed to be free of BPA, PVC and Phthalates. The natural brown color means that there are no added dyes, fillers or chemicals that may jeopardize safety. Each dish is left with a lovely natural tone that won't unnecessarily distract children from eating. Little Husks tableware items are made from a food byproduct that would otherwise be discarded and the dishes themselves are able to decompose completely, so they never need to make it to the landfill either. This makes them incredibly good for the environment and a great natural alternative to petroleum based plastic. They are also, far more practical than traditional alternatives like wood, metal or ceramic dishes for kids. Order Yours Today! Little Husks Dinner Plate - A safe and practical way to feed your children. Made from a food by product that would otherwise be destroyed, these plastic dinner plates are an environmentally friendly alternative to traditional kid's dishes. 100% Biodegradable. Order Yours Today!